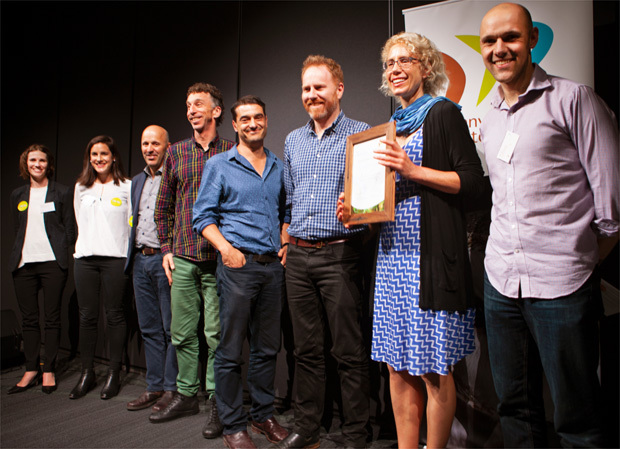 MASH (the campaign for More Australian Solar Homes) was one of six community groups and individuals from around the state to be recognised by Environment Victoria on Wednesday night for their outstanding contribution to protecting our state’s environment. “The 2018 Community Environment Recognition Award recipients are all leaders in their communities,” said Mark Wakeham, CEO of Environment Victoria. MASH, the community solar bulk-buy for households in central Victoria, was launched in mid-2014. Since then, MASH has taken orders for over 1,150 solar power systems with around 20,000 panels installed. MASH members at the Environment Victoria Awards. MASH households now cut around 8,400 tonnes of CO2 emissions each year, equivalent to around 1,700 fewer cars on the road. These households, as a group, are saving around $1 million off their electricity bills each year. In addition, MASH is creating local jobs with three local installation companies currently working full-time on MASH installations. There are also around six local people working on a part-time or casual basis on project management and administration. “MASH has raised over $70,000 for free solar for community groups and schools since we started, said Jo Kaptein, manager of the MASH community solar bulk-buy. The MASH solar bulk-buy is available in the Mount Alexander Shire, Macedon Ranges Shire and City of Greater Bendigo. MASH’s sister bulk-buy – the Hepburn Solar Bulk-Buy – is available in the Hepburn Shire. MASH will shortly launch in new regions across central Victoria, starting with Swan Hill. The not-for-profit Central Victorian Greenhouse Alliance now hosts MASH. Alternatively call 1300 466 274.